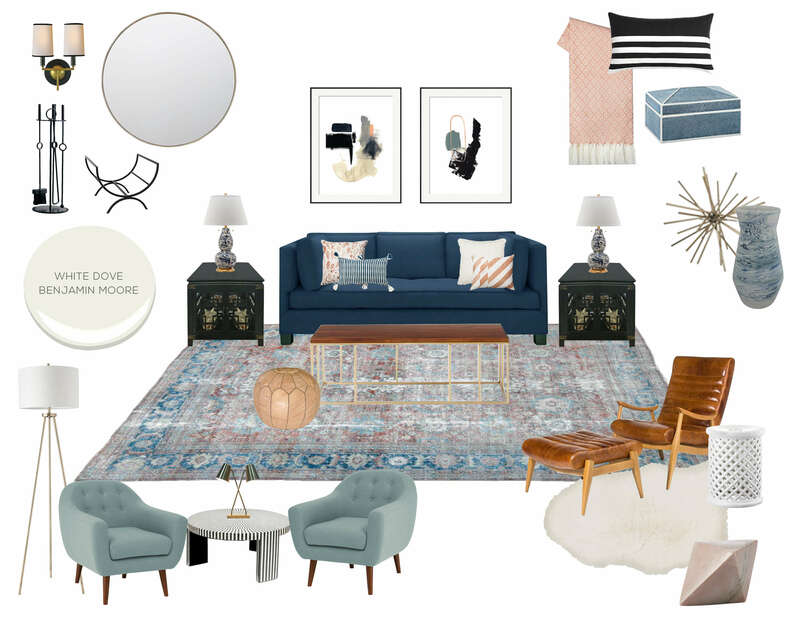 Hey everyone I’ve been working on some really good design projects over here and this living room makeover for the Silver Lake Hills Home is one of them. We (at EHD) actually posted about this many moons ago but their kitchen project really became more of a priority for them which is why we only just finished it up. I thought I’d give you bit of a progress update and intro to the reveal, which is happening next week! It was a weird situation really because the room is pretty much designed. The clients had been reluctant to have us involved because, well, they already paid for a designer to do it, 4 years ago and it is totally pulled together and functional. But as you’ll see, they didn’t really feel that it was ‘them’ and now that Emily has done the rest of the house this room feels jarringly different. The problems were mainly that it felt heavy, dark, lacking in personality, and just not their vibe. We generally don’t like to be negative but there was just something generic about it that felt like a designer had designed it, sitting from their desk with a bunch of catalogues; no sense of person or family here. The room was rarely used because it was just so serious and not very family friendly. It looked like it had enough seating, but nobody really wanted to sit in there. All the furniture was comfortable, but not even the kids wanted to lay around and read in there. They said there was just something really off putting about the whole thing. But, there were a lot of good things happening in there. So much so that when Emily first did the rest of the house she kept telling them ‘don’t spend money here’. In fact there isn’t anything I don’t like in here. Every single piece is good in the right environment. But all of it together feels somehow impersonal. And dark. 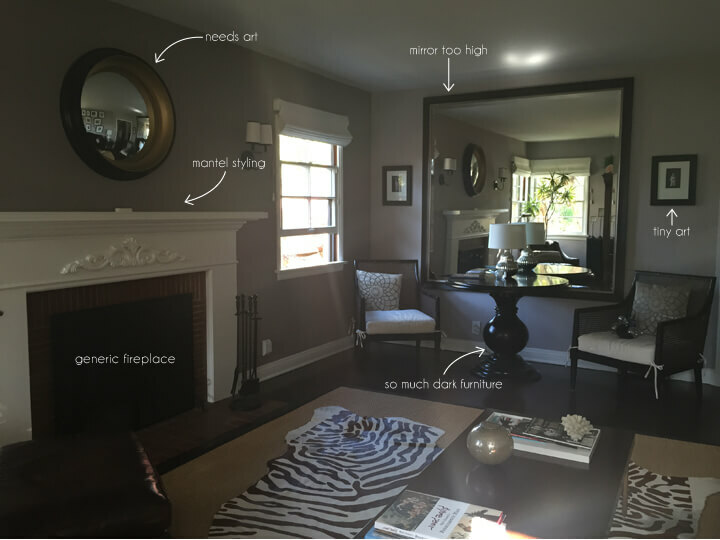 The sofa, side tables, frames, coffee table, chairs, armoire, other chairs … EVERYTHING is dark and feels so heavy. The first option involved reupholstering the sofa in a brighter (but still family friendly color), keeping the rest of the dark furniture as is (with new pillows). The wall color would go lighter (maybe not that shade, but something lighter and with more of a happy tone than the purple-gray that is in there). 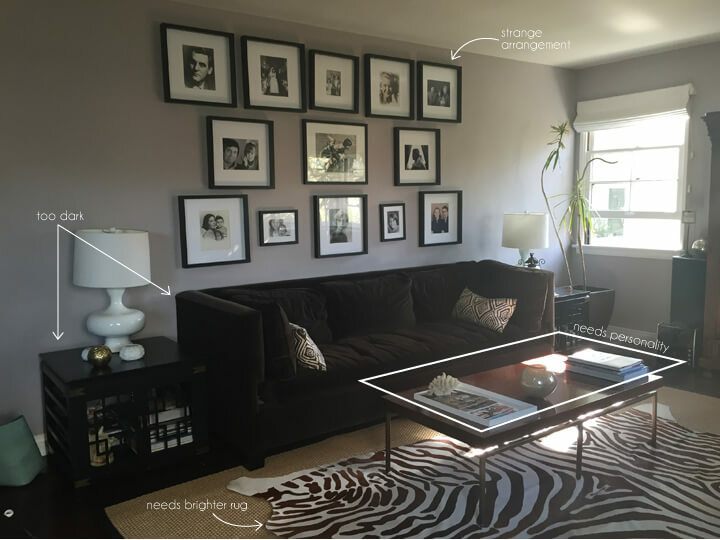 The room doesn’t get a ton of light so we wanted to go for a tone instead of bright white. 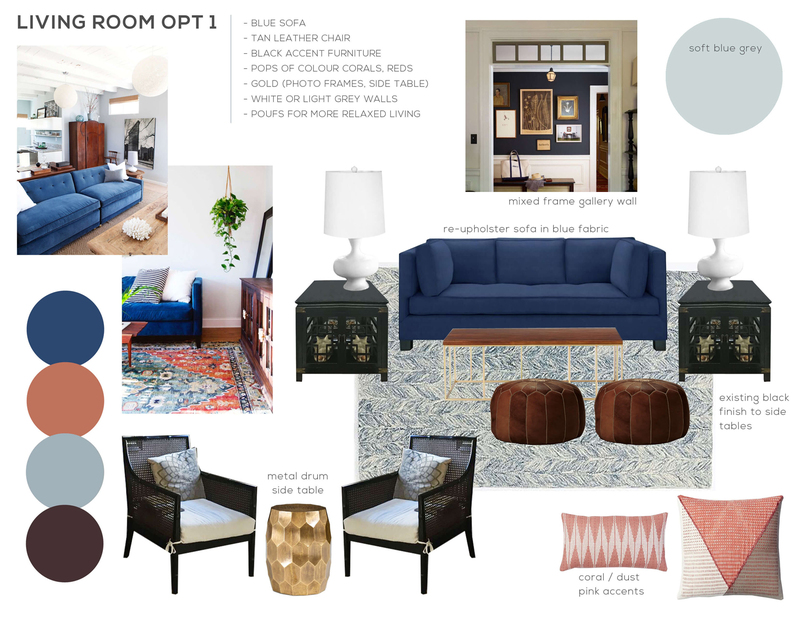 The second option would keep the brown velvet sofa and then refinish the side tables to be a lighter, prettier wood, and the rug would be more antique/aged to bring in some soul. 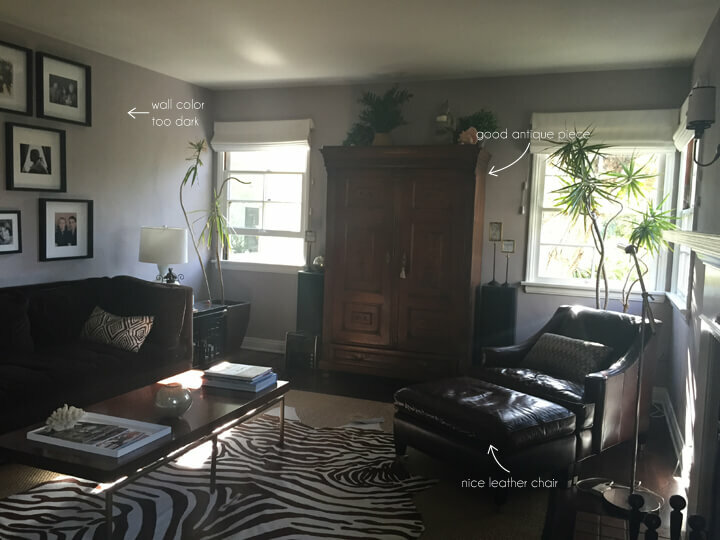 The photo of the brown sofa above is not good – it looks like the bad kinda brown not the rich luxe beautiful chocolate brown that it is (we photoshopped the color but you can’t really capture the pretty texture). 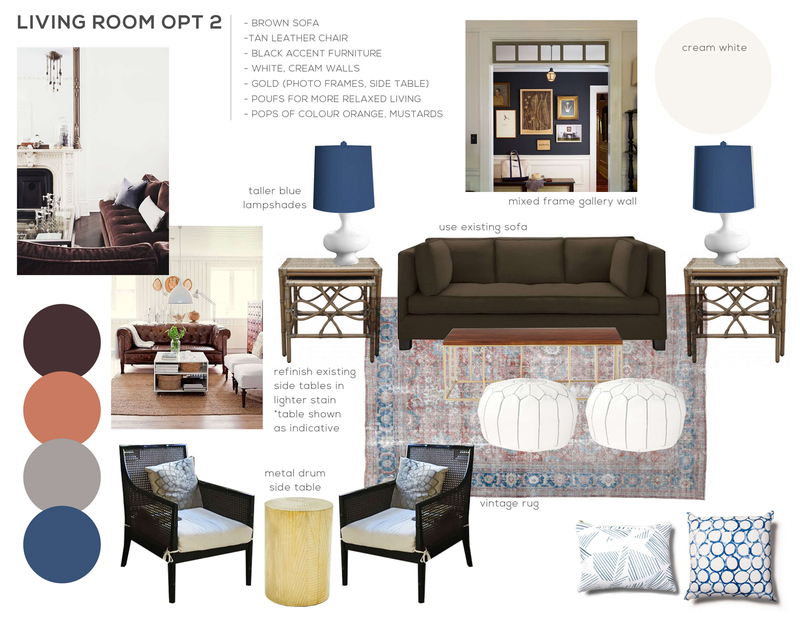 Part of us wanted to keep the brown because brown velvet is rarely used so it would be a really fun challenge to make that sofa work. 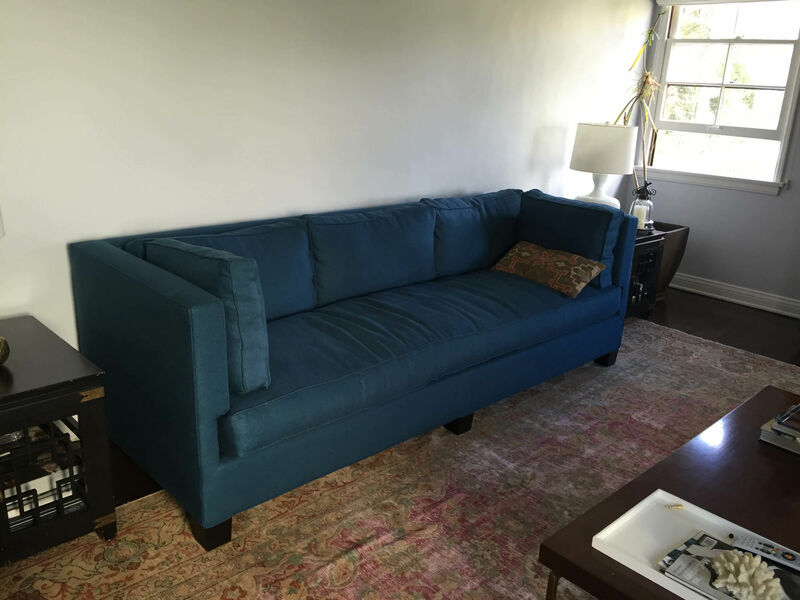 Plus that sofa is beautiful and new enough that we’d have loved to not put $1500 – $1800 of fabric/labor into it. 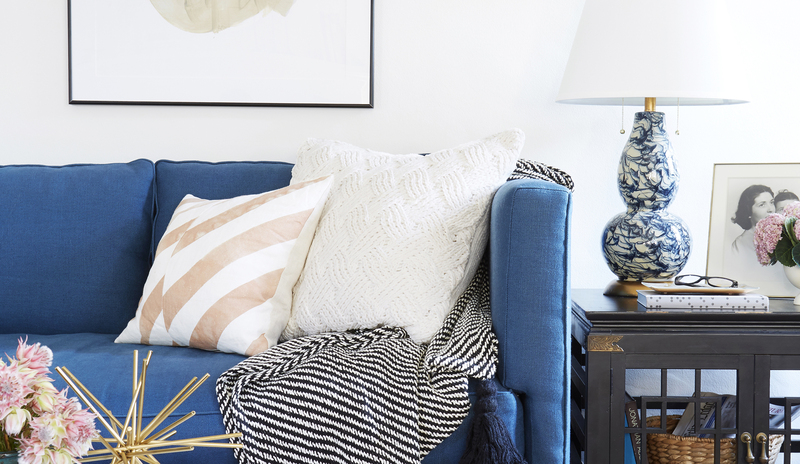 But remember that if the sofa stays dark then the side tables would need to change to be refinished which is at least $300 each = $600 total – not exactly free, but less. 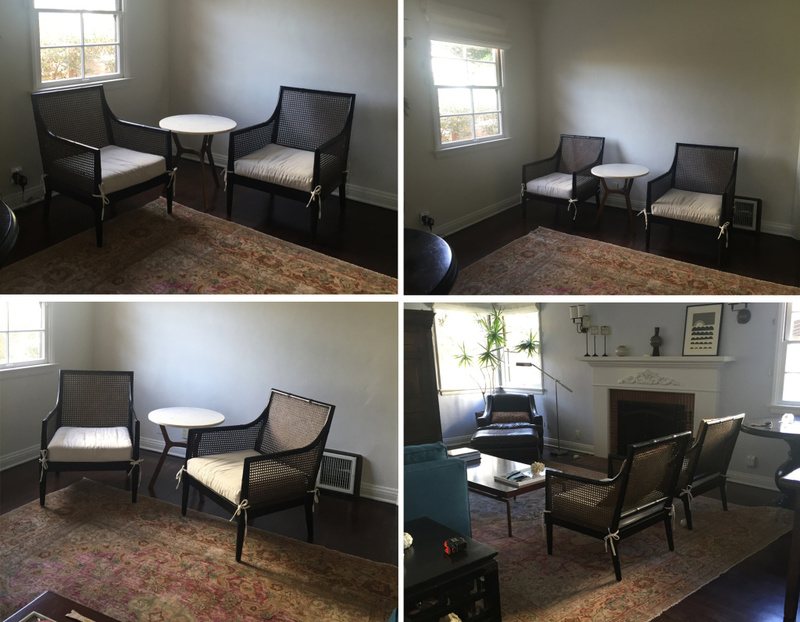 We loved the idea of a vintage Persian rug which would bring in some depth, warmth, color and most importantly soul that we needed. 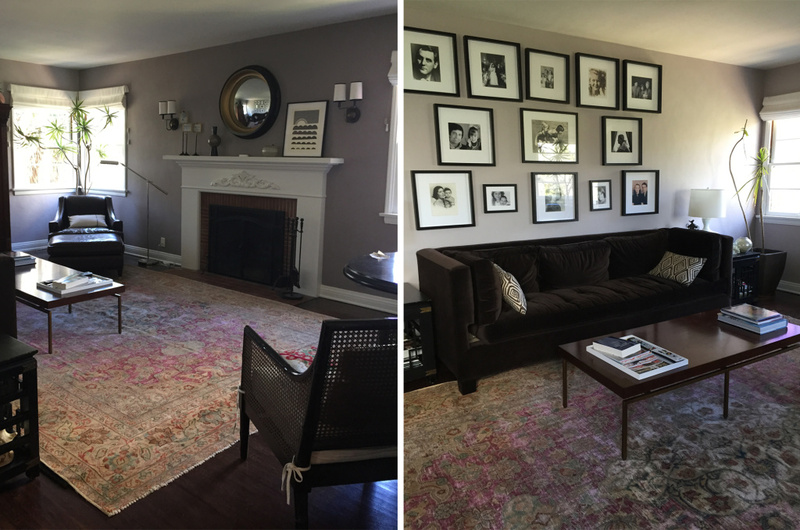 We hunted high and low to find the perfect one that didn’t cost a fortune, but finding an antique Persian that is 9×12 and light in tone (aka, not burgundy) for under $5k is virtually impossible, so we did consider buying a new rug (like in option 1). 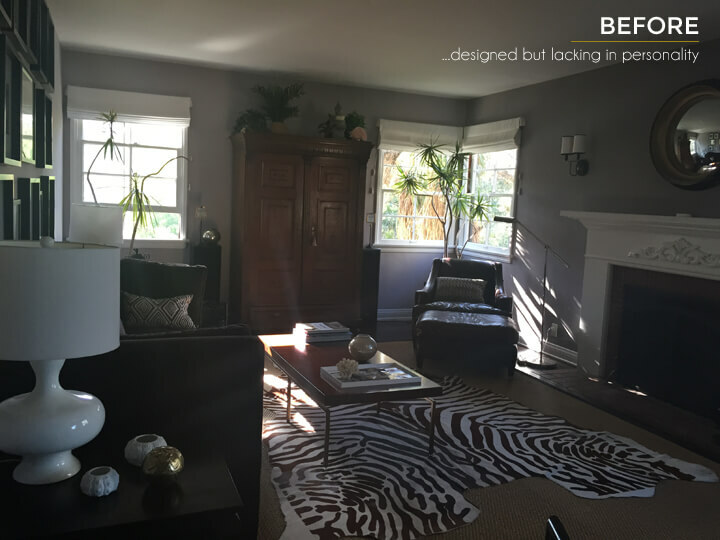 We also considered doing the overlaid look with a smaller 8 x 10 which would be cheaper and the sisal rug was still in really good condition. We memo’d a few options from a guy we know from the flea market but none of them felt right. They either didn’t pop off the floor and the tones just didn’t feel happy enough. That, and also we just really wanted a dope 9 x 12. Although now I thinking we should have hoarded the red and blue on on the right for Emily’s new house, it’s soooo purdy and beautifully worn! It was only when we took back these rugs that we found our gem! Worn, colourful Persian: Check. 9 x 12: Check. Price $2450: Check! Not exactly ‘cheap’ but pretty darn good. 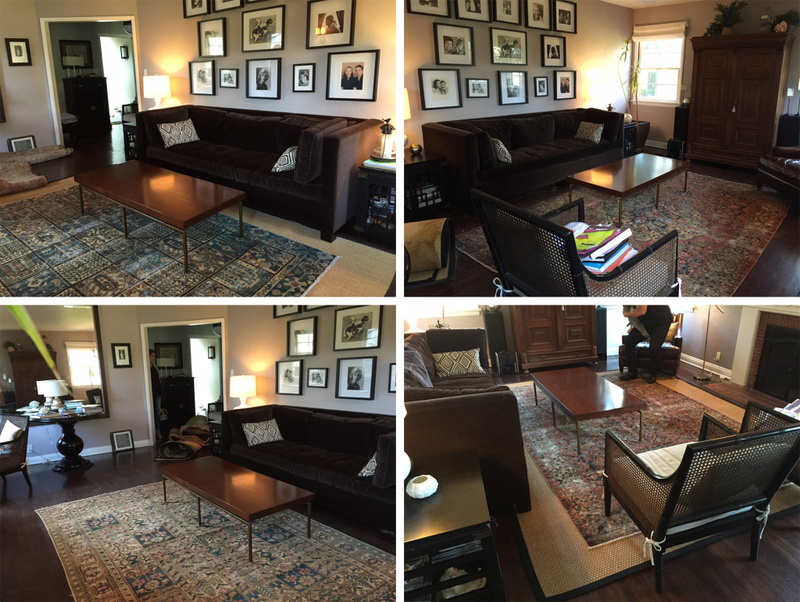 Once we got the rug in we had to make some dramatic changes to everything else. Even though it wasn’t the worst thing in the world, the brown velvet had to go and make way for something happier and younger. 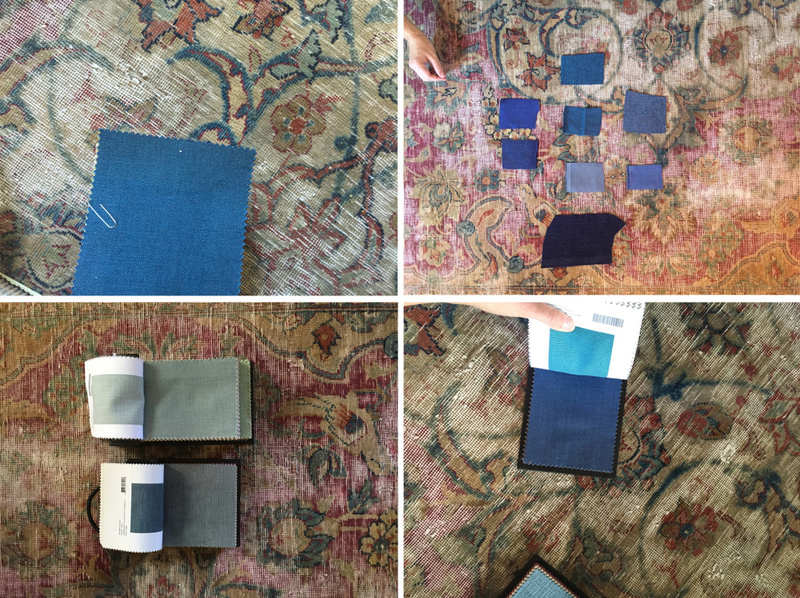 And now we had our rug so we could pull colours from that for the fabric. Close up, there are lots of subtle dusty greens and dark blues in the rug so we headed in that direction. 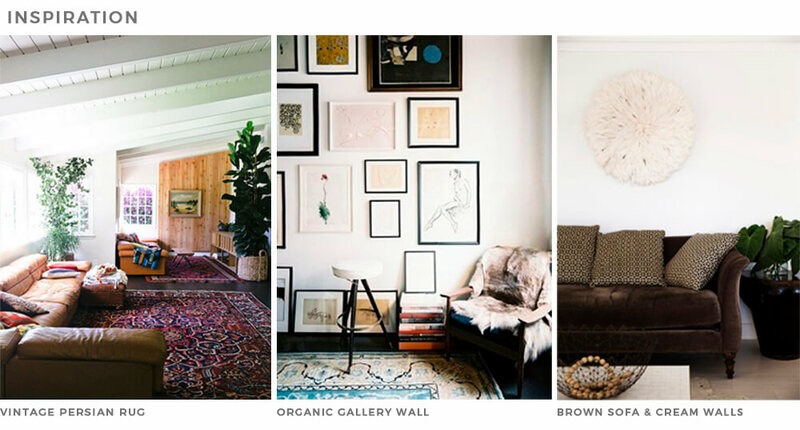 The lighter dusty greens (bottom left) felt super pretty and calming but we really wanted to amp this room up since the rest of their house is so playful. Some of the blues tended to head in more of a purple direction which we definitely didn’t want to do. So we went with the top left. This has a good balance of green in it while staying true blue. 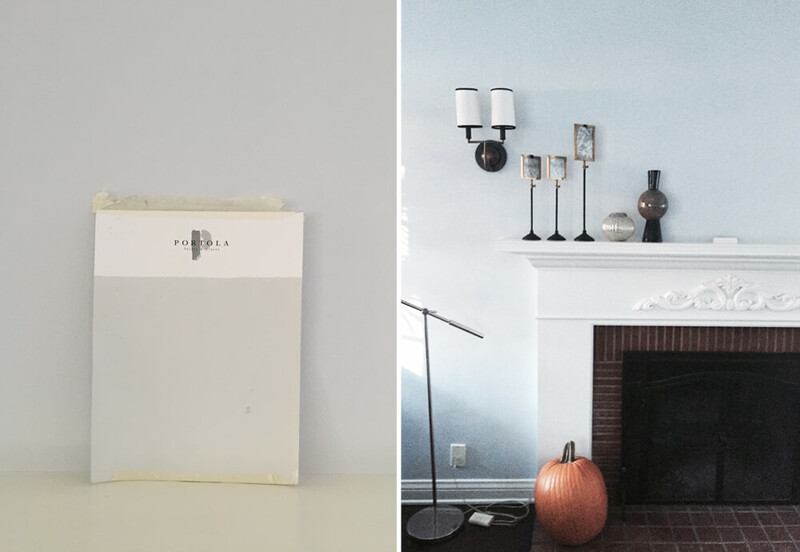 We also painted the walls which was an actual disaster and you can read about it here. We wanted it to have a light tone grey to it but the colour we went with ended up looking baby blue. We did a ton of swatches before and the swatch we chose looked grey but clearly had blue undertones that we just didn’t see. It was a total bummer and one of those situations where no one person that was at fault. So we knocked off a few hours time which essentially equated to having the room repainted. Nothing makes me personally more sad than disappointing a client, and I’ll be the first to hold my hand up at any mess ups. The family was unbelievable sweet and more than understanding about the situation. Fortunately it was just paint and I do still stand by that it was grey! The next conundrum was whether to change out their chairs or not. Again, it’s not that we didn’t like them, we just didn’t love the positioning of them. They also felt like they weren’t really ‘in’ the room and not very conversational with the rest of the space. 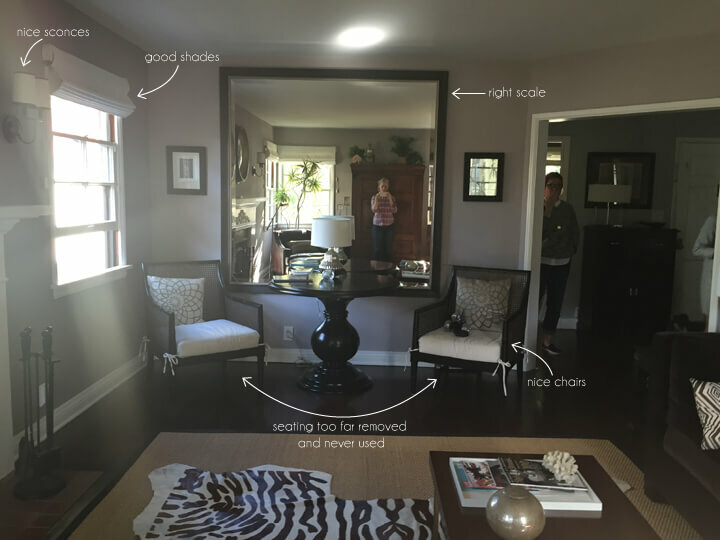 They also didn’t really have the need for the round dining table that was there before and liked the idea of bringing in a side table or smaller coffee table. Which meant that area was opened up even more. It was quite silly how long we OBSESSED over the location of the chairs and ultimately it came down to the fact they they just weren’t right. 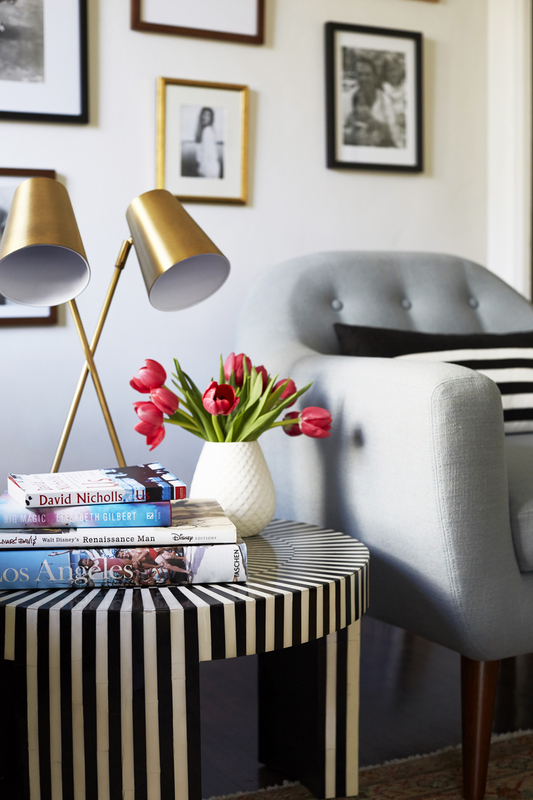 We wanted something more rounded, like a club chair, and upholstered so that it felt warmer and more cosy. The only other major-ish changes we made were to the fireplace. We removed the decorative flourish from the surround and painted the bricks black. It took them some convincing with the colour but now it looks bigger, cleaner and more modern – a cheap upgrade that has made all the difference. Tune in later this week for the full reveal but here is a sneak peek of the after photos.